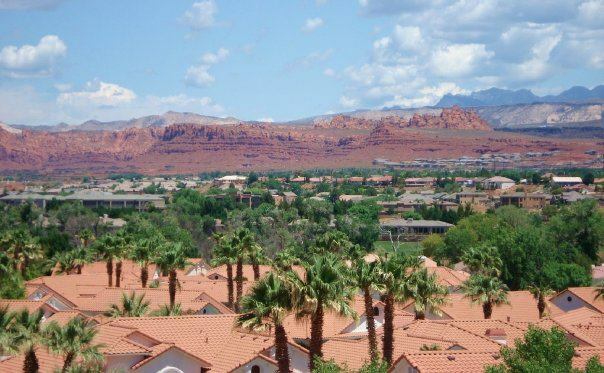 Between the view, the affordability, and the weather, it’s hard to pick just one reason to move to St. George. We love it here and we think you’ll love it too! Here’s everything you need to know about relocating to St. George Utah. St. George is on the border of Arizona sitting just south of the Red Cliffs National Conservation Area and Snow Canyon State Park. Because of this, we have beautiful views and a very pleasant outdoors. We are less than 2 hours to Las Vegas, about 6 hours to Phoenix, and 4 hours to Salt Lake City. St. George’s average commute time is just 16 minutes. Because of this, most people don’t carpool. Only 15% of residents carpool to work and 6% work from home. BUT, ST. George is not very walkable as we only have a walk score of 29, so a care is a good mode of transportation. Our bus service offers just 6 routes, which is usually sufficient enough for most commuters in St. George. The SunTran Interactive Map can help with transit routes. Voter Registration: Register to vote in St. George. Driver’s License: Start here to get a Utah driver’s license as soon as you move. Out of State Vehicle Registration: If you’re bringing your car with you, you should probably update your plates at some point too. Here’s where to go to get Utah license plates. Trash & Recycling: Set up trash pickup through Washington County Solid Waste. St. George is in the Washington County School District. There are 6 middle schools, 4 are in ST. George. View all middle schools here. There are 8 high schools, 5 of which are in St. George – View all high schools here. There are also several pre-schools, and 3 intermediate schools in St. George. We have one special education, post-high school as well. We even have the Southwest Adult High School. Want more information? Sign up for my ST. George guide and I’d be happy to help you Relocate to Sunny St. George!